St Patrick’s Day and the first day of Spring are both almost exactly one month from today! We are excited about Spring and the newness which comes with it! I am especially looking forward to the many different crafts you will be sharing with us for this part of the Spring Craft Blog Hop. Be sure to visit the first part of this four part series where there are 189 different craft ideas all in one place to scroll through and visit here! Welcome to the second in a four-part spring craft blog hop challenge for the spring season! This hop will run from February 18 – March 17 and we’re challenging you to create a craft project that reflects St. Patrick’s Day, Palm Sunday, April Fools, or a General Spring theme. I’m excited to have 20 blogs participating in the second installment of the Spring Craft Blog Hop. This means your crafts will be shared on all 20 blogs! Please join us in this challenge and link-up your crafty creation at the bottom of this post. 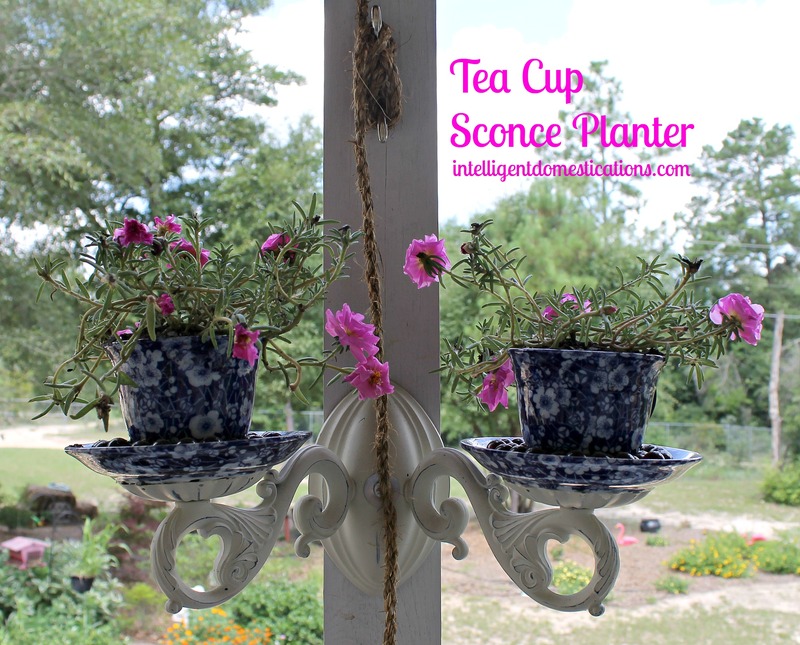 To kick of the second part of the Spring Craft Blog Hop, I’m sharing this Tea Cup Sconce Planter project. We up cycled an old sconce to create a beautiful planter for our Porch Makeover project. Find the full tutorial here. Show us what you’ve created and be seen on 20 blogs! Thank you for hosting all of this fun creativity! Robin, you are so creative! You inspire me! I have furniture sitting in my new storage building/workshop waiting on nicer weather to re-do! Can’t wait to see your Spring crafts, so glad you are participating with us! Thanks for hosting and for joining us at Inspire Me Monday at Create With Joy! Glad you stopped by to link up with us! It’s always fun to be inspired by other crafty ideas, so much fun! Looks like a fun linky party. I am excited to see all the fun crafts!!! It is a fun party, Zan. I look forward to seeing what crafts you will share with us at the party! I know you are being crafty with your sweet little girls!